As a hot war between the U.S. and North Korea over Pyongyang’s nuclear weapons aspirations appeared to inch closer to reality, the United Nations’ fourth annual International Day for the Total Elimination of Nuclear Weapon comes at a historic moment of brinkmanship. With that war of words and North Korea’s claim of a successful hydrogen bomb test this month as a backdrop, the United Nations again pressed for the end of nuclear weapons worldwide and specifically called on Trump and Kim to end the volley of threats. « The prevailing security challenges cannot be an excuse for continued reliance on nuclear weapons and for abrogating our shared responsibility to seek a more peaceful international society, » U.N. Secretary-General Antonio Guterres said in a statement. As North Korea seeks to join the community of nuclear armed nations, this is what’s known about the current state of nuclear arsenals around the world. Nuclear states have always closely guarded the exact number of nuclear warheads in their arsenal. But each year, the Federation of American Scientists (FAS), an international nuclear weapons watchdog, publishes a report that estimates the current number of nuclear weapons around the globe. Since the Cold War ended, nuclear-armed countries have significantly reduced the number of weapons from more than 70,000 in 1986 to nearly 15,000 in 2017, according to FAS. The U.S. and Russia own and control 93 percent of all nuclear warheads in the world, according to the watchdog. 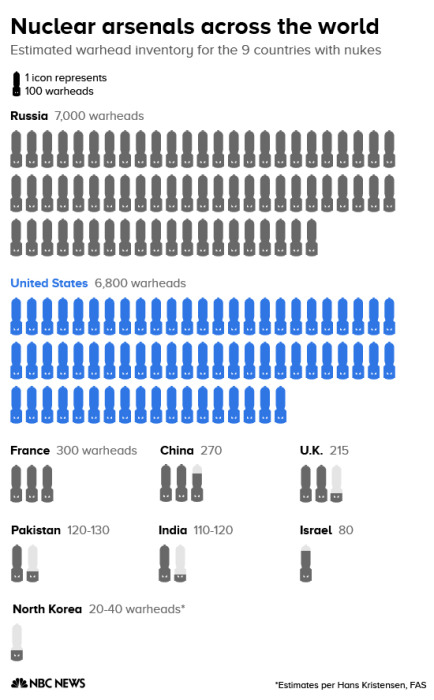 Although the vast majority of weapons are either stockpiled or retired, FAS currently estimates that the U.S. has 1,800 nuclear weapons at the ready, compared to Russia’s 1,950. 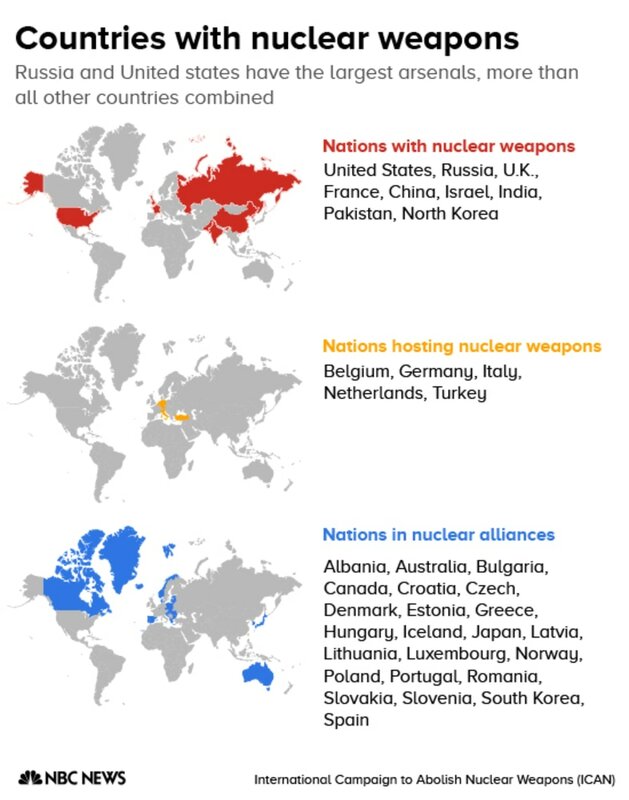 The remaining nuclear-armed states hold only a few hundred weapons. Hans Kristensen, director of the Nuclear Information Project at FAS, said there’s still a great deal of work to be done to reduce nuclear stockpiles. Kristensen said he believes both the U.S. and Russia are continuing to create and store weapons in an attempt to compete with each other. What’s being done to reduce nuclear weapons? On Sept. 20, more than 50 U.N. member states signed the first legally binding international treaty to prohibit the use of nuclear weapons. The document, called the Treaty on the Prohibition of Nuclear Weapons, represents a historic step in the decades-long crusade to rid the world of nuclear weapons — but not a single nuclear-armed state signed the treaty. But that doesn’t mean other armed nations aren’t also working to reduce their global nuclear arsenal. In 2010, President Barack Obama and the president of Russia at the time, Dimitry Medvedev, signed the New START treaty, renewing the longstanding bi-lateral commitment to reducing the size of their country’s nuclear arsenals. Under the agreement, each country has until the treaty goes into effect in February 2018 to reduce the number of weapons that are readily available for military use to 1,550 warheads and bombs. According to the State Department’s most recent status report on the treaty, Russia currently has 1,765 weapons at the ready compared to the United States’ 1,411. The START treaty continued a bi-partisan international effort to reduce the number of nuclear weapons that was started by President Ronald Reagan after the Cold War. What is the current U.S. stance on nuclear weapons? President Trump has been a vocal proponent of strengthening the U.S. military’s nuclear capabilities. 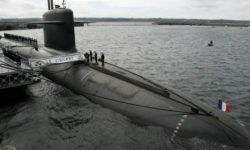 But he also inherited from the Obama administration a commitment to modernize the U.S. nuclear program. Kristensen said he believes that that will form the basis of Trump’s approach to the U.S. nuclear program. In January, Trump directed the secretary of defense to begin a review of the country’s nuclear posture. That process officially began in April, and a final report will be issued at the end of the year, according to the Pentagon. There are no concrete estimates on the number of nuclear warheads in North Korea, but Kristensen and other analysts agree that Kim Jong Un’s regime has produced enough nuclear fissile material to arm and assemble a ballistic missile. Kristensen estimates that Kim could have from 20 to 40 nuclear weapons in his arsenal. 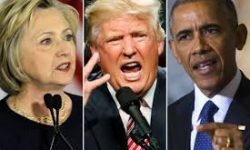 But he said he’s more worried about the unpredictability of the ongoing war of words between Trump and Kim than he is about the North Korean dictator launching a missile. « It’s spinning out of control, that’s the fear, » he said. « Every single time Trump puts out one of his tweets and starts his boxing-ring kind of arguments, it feeds totally into the North Korean agenda back home.